Robe, 2 bath and 1 hand towel included. We recommend you bring flip flops if you are planning on using the shower. A robe (to get from the change room and back to the shower). A bath towel to sit on and use for your shower. When you are in an infrared sauna, you are releasing toxins. It is essential to shower after your sauna. A hand towel for while you are in the sauna. Toxicity from Heavy Metals such as Lead and Mercury, Pesticides, DDT, PCBs, etc. Weight loss. (Studies have shown that 30 minutes in an infrared sauna can burn upwards of 600 calories). The word sauna is an ancient Finnish word referring to the traditional Finnish bath as well as to the bathhouse itself. It has a long history, going back at least a thousand years and probably many more. Originally, the sauna was a place to bathe, but as it was also the only available clean place with abundant water, it has also been a place for giving birth and healing the sick. Virtually all of the positive health results from far infrared saunas that have been reported in medical journals and at medical conferences were achieved using only ceramic plate heaters, the type which SaunaRay has made famous. 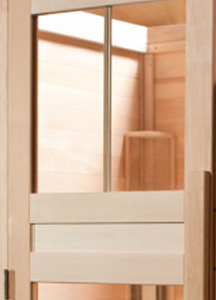 SaunaRay is the leading manufacturer of Medical-Grade saunas for the North American health industry. SaunaRay conducts primary medical research on the positive impacts of far infrared sauna therapy. The results are shared with the many medical doctors using these units in their clinics. SaunaRays are built by hand in Canada (Collingwood), and with great attention to detail. Only non-toxic materials are used from start to finish. The wood is allergen free, kiln dried Basswood. The heat emitters are medical grade ceramic plates. They are assembled in Canada with medical grade stainless steel, and finished with a toxin-free ceramic coated caging which makes every unit child-safe. They have the lowest Electro Magnetic Field on the market by 10-80x, (as measure by Dr. Magda Havas, PhD. Associate Professor Environmental & Resource Studies, Trent University, Canada) and are thus safe for people with Electrical sensitivities. WHO RECOMMENDS INFRARED SAUNAS & SAUNARAY? Dr. Alan Logan ND of Harvard Medical School, in “The Brain Diet”. Dr. Alison Bested MD, and Author of “Chronic Fatigue Syndrome and Fibromyalgia” had this to say about SaunaRay in her latest book: “This company specifically manufactures infrared saunas with materials friendly to Chemically Sensitive, Chronic Fatigue, Fibromyalgia patients.” From, Hope and Help for Chronic Fatigue Syndrome and Fibromyalgia (2006). In 2006, SaunaRay organized the first heavy-metal, solvent and chemical detoxification study with Dr. Gordon Ko, MD (University of Toronto) and Sat Dharam Kaur, ND, BSc. (Canadian College of Naturopathic Medicine.) Blood analysis before and after only fifty hours of sauna therapy, showed a 20% decrease in PCB’s, Pesticides, and Dioxin. Mercury levels were reduced by 30%. In 2011, Dr. Stephen Genuis of the University of Alberta used a much larger sample group and analyzed thousands of test results. It showed conclusively that dozens of toxic metals, solvents and chemicals are effectively removed from the body’s tissue by the simple act of sweating.